A decade ago, a group of forward-thinking business leaders came together for a cup of coffee in Saint John. They knew that Information Technology was economic engine of the 21st century, and the East Coast needed to be part of that world. They wanted to form a group to help that happen. Little did they know they were writing the first chapter in an important story, something that would create a successful Accelerator and foster a vibrant and growing startup scene on the East Coast. There was proof the region could compete and succeed. Years earlier, through leadership committed to innovation and risk-taking, NBTel carved out a niche as one of the most advanced telcos in North America. The Propel founders wanted to extend that NBTel DNA to others. And so Propel ICT was born. For the first few years, it was focused on helping companies in the Saint John region start and succeed. From those early seeds grew powerhouses like Mariner Partners, Brovada and Radian6. With this success, the Propel ICT mandate was broadened to cover all of New Brunswick. Six more companies launched between 2008 and 2011 and Propel’s extensive coaching and mentor network took root. 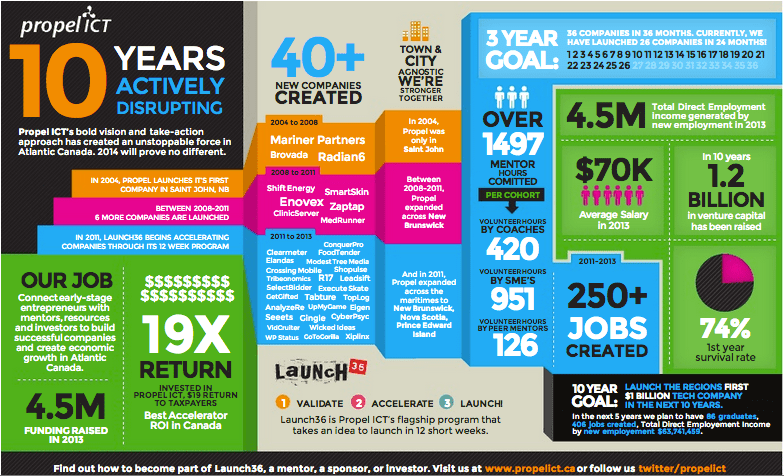 The proven impact and growing thirst for startup mentorship led Propel ICT to expand its scope to all of the Maritimes in 2011. Propel also introduced Launch36 that year, an ambitious Accelerator program to help 36 companies form and launch in only three years. In the first two years of the program, 26 companies were launched and we are on track to hit our 36 companies target this year. So from that fateful cup of coffee in Saint John, Propel ICT has created real results. In the past decade Propel ICT companies raised an impressive $1.2 billion in venture capital funding. In the last three years alone, companies under the Propel ICT umbrella created more than 250 jobs. Propel ICT delivers ROI. Every dollar invested in Propel ICT’s programs yields a $19 return to taxpayers. That’s the best Accelerator ROI in Canada. Propel ICT has played a central role in the growing startup ecosystem in Atlantic Canada, along with our partners in business, post-secondary education, venture capital and government. So what’s next for Propel ICT? It’s simple. We go bigger. Propel is expanding to include Newfoundland & Labrador. With our established network of coaches, mentors and support in the public and private sectors, Propel ICT will continue to be the signature Accelerator program in Atlantic Canada. The doubters said we could never launch 36 companies in three years. We’re on track to do it. They said that venture capital from outside the region would never be invested here. VCs are flocking to the East Coast. They said jobs would never be created. But they have been. So our next target will be even bigger: we want to see 86 companies graduate from our Accelerator program in the next five years. We also want to see a billion dollar tech company emerge on the East Coast. Over the past decade, we’ve seen that by working together with common purpose and a regional perspective, we can help entrepreneurs to succeed and prosper. A decade in, everyone who contributed to Propel ICT can stand back and see that it has had a real impact on the East Coast economy. But these are still early days in our story. We need to double down and push even harder in the years to come. So let’s get at it.